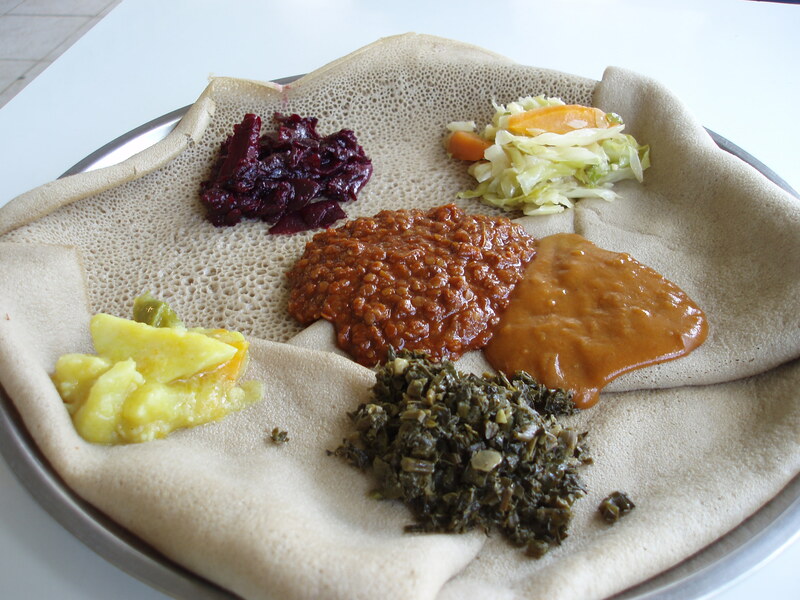 There is a 55-day Lenten fasting period before Fasika during which Orthodox Ethiopians adhere to a strictly vegan diet: no meat, eggs, or dairy products are allowed. On top of that, they only get to eat one meal a day and it has to be after 3 pm. Starting on Good Friday until Easter Sunday they don’t eat or drink anything at all. Needless to say, folks are jonesing for some animal protein by the time Easter finally arrives. 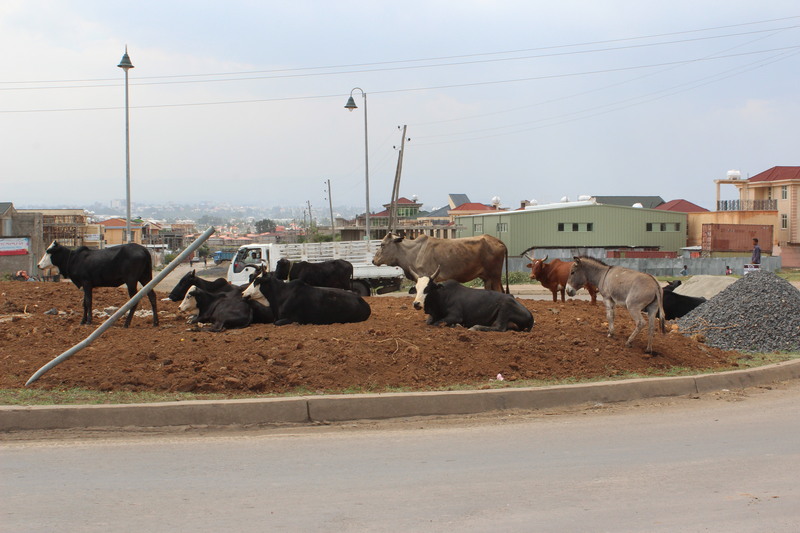 Driving to and from Debre Zeyit, we saw sheep, goats, and cattle for sale on almost every streetcorner and vacant lot. People were buying live animals and leading them home on ropes, tying them onto the roofs of their trucks or even loading them into the trunks of little cars in preparation for their big Fasika feast. The day before Easter, cattle for sale in the roundabout next to our apartment. Don’t worry, no one’s going to eat the donkey. Yesterday one of the grade 1 girls brought show-and-tell photos of her family slaughtering their Easter sheep. Lots of snapshots of small children with their hands full of intestines and lungs. Their teacher said she wasn’t sure if she should post them on the show-and-tell wall: “Some of the American parents are kind of funny about that.” The longer I stay away, the weirder Americans seem. 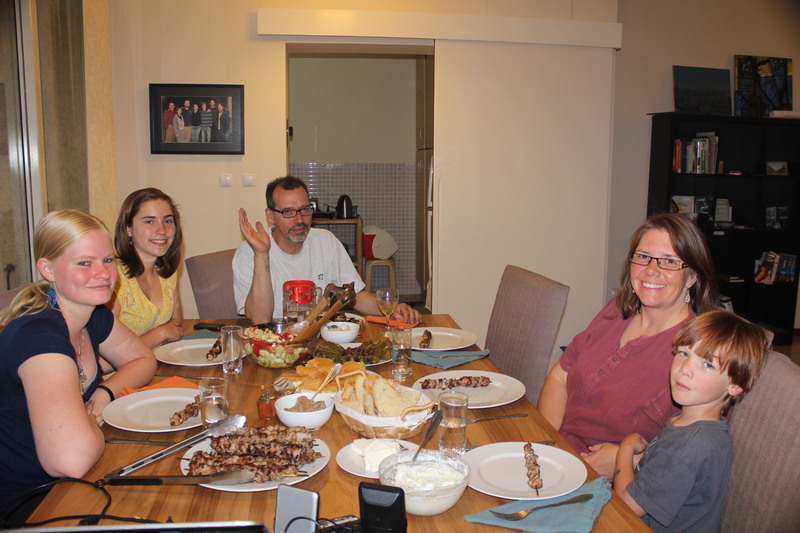 But I don’t want to freak anybody out, so here’s a picture of our not-at-all-gory Greek Easter feast: souvlaki, dolmas, tiropita, tzatziki, hummus, melitzanasalata, bread, Greek salad, olives, feta, and baklava. This entry was posted in Ethiopia, Food and tagged Easter, Fasika. Bookmark the permalink.